The United States has said there is "mounting evidence" that Syria, Iran and Hezbollah are planning to topple the Lebanese government. Syria's ambassador to the US rejected the allegations as "ridiculous". Imad Mustapha said the United States should stop blaming other countries for its own mistakes in the Middle East. 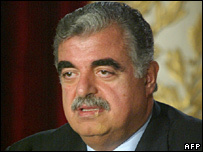 A UN team has been investigating who was behind Mr Hariri's death in 2005. The BBC News website's world affairs correspondent Paul Reynolds says the White House statement appears to result from the tense situation in Lebanon, where Hezbollah is demanding one third of cabinet seats, thereby giving it a veto over decisions. Such a veto would enable it to block approval of the international tribunal to try suspects in Mr Hariri's assassination, our correspondent says. Former US Secretary of State James Baker is heading a bipartisan Iraq Study Group, considering future strategy in Iraq for US policy makers. The White House said it was "increasingly concerned by mounting evidence that the Syrian and Iranian governments, Hezbollah, and their Lebanese allies are preparing plans to topple Lebanon's democratically-elected government. "There are indications that one goal of the Syrian plan is to prevent the current Lebanese government from approving the statute for an international tribunal that would try those accused of involvement in former Prime Minister Rafik Hariri's assassination," the statement continued. But the Syrian ambassador to the US, Imad Mustapha, told the BBC's Newshour programme that the allegations were "ridiculous, verging on the silly". "It's a shame that the United States, a world superpower, would belittle itself to such petty politics. Let's be clear about this. Today, in Lebanon, there is a domestic political bickering. This is a purely Lebanese issue. "We, in Syria, respect the sovereignty of Lebanon, we are not interfering on this, and we call on the United States to follow suit and not to interfere in Lebanese domestic issues," Mr Mustapha said. In March, the UN Security Council approved the formation of an international tribunal that would try those accused of involvement in the murder of Mr Hariri. The UN sent a draft plan for the tribunal to Lebanese authorities on 21 October but it has yet to be approved of by Lebanon's cabinet and parliament or by the UN Security Council. Mr Hariri was killed on 14 February 2005, along with 20 others in a massive blast on Beirut's seafront. UN investigators said in September they had found new evidence that he was probably killed by a suicide bomber. The assassination has been widely blamed on Syria, but Syrian President Bashar al-Assad has repeatedly denied that his country had anything to do with the killing.